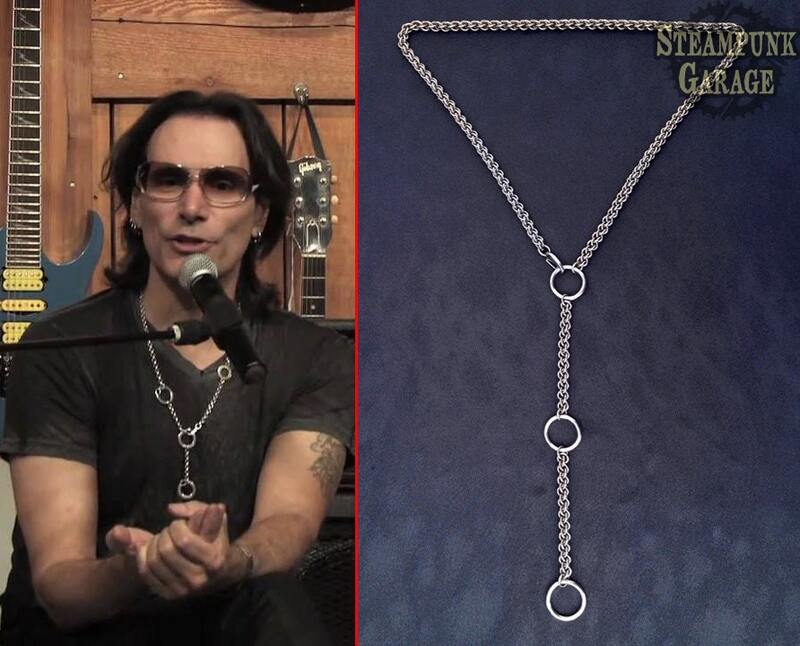 This is a necklace extremely similar to the one Steve Vai wears. His original chain is woven sterling silver wire while ours is made with stainless steel using the JPL twist weave. The larger rings are welded marina-grade steel and the clasp is too - so no part of this will rust or tarnish even if worn in saltwater or chlorine. The handmade chain measures 34 inches and the welded rings add an extra 3 inches to that. It clasps to any of the three welded rings depending how you want to rock this bad boy. Comes with a lifetime guarantee against abuse or defects - no questions asked! Stainless steel and titanium are hypoallergenic. They will never rust, tarnish or leave black on your skin. Wear your Steampunk Garage jewelry in the shower, the pool, or even in saltwater. You never have to take it off if you don't want to; it will look new forever! We tumble all our rings for 10-12 hours before working with them to remove burrs, oil, and give them a great shine! It's a great quality necklace. I highly recommend it. Received my chain today and I love it. Very good quality, very nice seller. Very nice chain, very durable and great for daily wear. Happy with my purchase and would definitely order again from this seller. I like the weight and the look of the wallet chain. Doesn’t look cheap. I will have this chain forever.